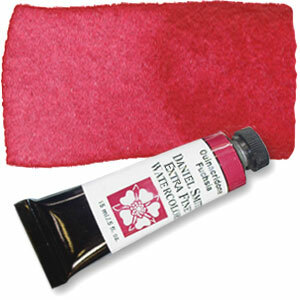 A necessary watercolour for painters who embrace colour - a brilliant, slightly violet, red. Never bashful, Quinacridone Fuchsia remains strong even when mixed with water. Your light washes will be bold and, at full strength, few paints can compare to the uncompromising richness of Quinacridone Fuchsia. Completely transparent and satiny smooth, this radiant watercolour is sure to become a staple on your palette. Highly durable and extremely transparent, all the Quinacridone colours excel in vivid clarity and intensity. Click the button below to add the Quinacridone Fuchsia Series 2, 15ml Tube Daniel Smith Extra Fine Watercolour to your wish list.